A sample of white millennial participants viewed real tweets on the topic, then answered questions about their perceptions of the issue and about who tweeted the messages, Eye-tracking equipment mapped the time participants spent reading each post, used as a proxy for their attention to the tweets. According to the eye-tracking data, participants looked longer at messages from white Twitter users, while self-reported data showed that they would be more likely to engage with black Twitter users on the topic. "Twitter is an important outlet. We know that," said Joseph Erba, assistant professor journalism & mass communications and lead author of the study. "We also know from traditional advertising and marketing literature that the visual identification of the communicator matters as well. What we were interested to see is if the visual identification of a Twitter user influences how people perceive the message. It does." Erba co-wrote the study with Yuchen Liu, graduate student, and Mugur Geana, associate professor of journalism & mass communications. They will present their research at the International Communication Association conference in May. The research was conducted at CEHCUP's Experimental Media Research Laboratory in the School of Journalism & Mass Communications. A few weeks before completing the experiment, researchers gave participants a questionnaire to assess their perceptions of race and feelings about the NFL protests. For the experimental component of the study, the research team gathered real tweets about the topic, both in support of and against the protests. They constructed new Twitter identities to present the tweets featuring pictures of users who were either a white man or woman or a black man or woman. During the experiment, participants were exposed to tweets either for or against the NFL protests, delivered by one of the gender/race combinations of Twitter users. Afterward, participants took a post-test asking the same questions about their perceptions of the protests and feelings regarding black Americans. They also answered additional questions about the tweets and the person tweeting. 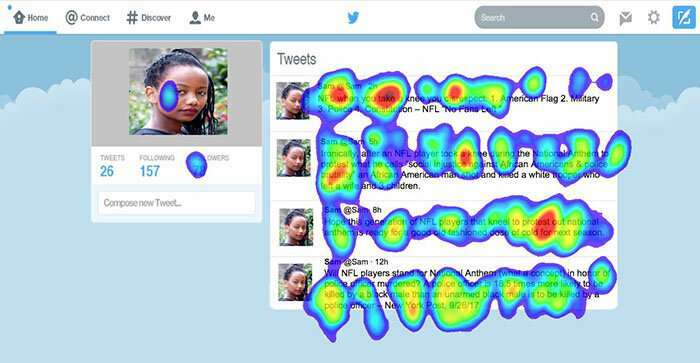 Eye-tracking software indicated they looked the longest at tweets from white people, especially males. However, when asked after the study who they thought was most credible on the topic, and who they would most likely engage with, participants rated black users, especially male, the highest. That contradiction indicates race can influence audience attention and that self-reported data should be viewed cautiously, Erba said. Respondents also widely reported changing their feelings about the protests after reading the tweets. Those who were exposed to tweets in favor of the protests had an improved view of the subject, and the inverse was true for those who saw tweets against the movement compared with their views about the protest about three weeks earlier. Each participant saw four tweets. "Four little tweets were enough to significantly change their views on the NFL protests. We did not find a difference in their attitudes toward black people or racism though," Erba said. "We think it was because the tweets were directly about the protests, and making the connection to larger issues may have just been too much." A number of communication theories are likely at play and can help explain why participants reported more credibility for tweets from users they looked at less. Social identification theory posits that individuals are more attracted to what people who look like them have to say than those who don't. Identification theory holds that people will provide information to help ensure they are viewed as how they want to be perceived by others, as opposed to how they really are. The latter likely helps explain why participants said black Twitter users were viewed as more credible on the topic. Race is a central issue in the protests and subsequent debate, and the research found that race of a Twitter user matters. White respondents reported that black Twitter users were more credible. "Yet, if you look at the (2016) elections, 40 percent of white millennials voted for Trump," Erba said. In the study, they looked more at people who looked like them, but when asked directly, said they supported black men." The majority of NFL players are black, and police brutality, the central issue of the protests, disproportionately affects black Americans, especially men. Therefore, the authors hypothesize that when white millennials are asked to think about tweets from black men in the self-reported data, they may perceive them as more knowledgeable about the topic. However, eye-tracking data indicated that, subconsciously, the participants still pay more attention to tweets from white men. The researchers plan to look further into the issue. The current findings revealed several items of note for researchers and those trying to reach millennials. Namely, race and identity matter when it comes to Twitter, and that conscious and unconscious responses were different, suggesting self-reported data should always be viewed cautiously. Finally, the messenger can be just as important as the message. "If you want a message to hit home with white millennials, you have to think not only about the message but who is delivering the message," Erba said. "There needs to be a 'match up' between the topic discussed and the perceived identity of the spokesperson."